An owner of a Haflinger horse wrote to ask if Western actor Randolph Scott's horse was a Haflinger? Sorry to say, while his horse was a light gold or rich golden chestnut with both a flaxen mane and tail, his horse "Stardust" was a beautiful palomino. Haflinger horses are an old breed that originated in the mountains of the Austrian Tyrol. The name comes from the village of Hafling, part of Austria prior to the end of World War I, but now located in Italy. The breed is also called the Avelignese, from the Italian word for Hafling, which isAvelengo or previously Aveligna. The Food and Agriculture Organization recognizes both an "Avelignese" and an "Avelignese Tradizionale" as existing in Italy. Although, as of 2007, only 13 of the latter existed, including only one breeding stallion. However, all breed organizations recognize and register only one type. Because od World War I, many Haflingers being taken into military service and the interruption of breeding programs. After the war, under the terms of the Treaty of Saint Germain, South Tyrol , including Hafling, was ceded to Italy, while North Tyrol remained in Austria. This split was extremely detrimental to the Haflinger breed, as most of the brood mares were in South Tyrol in what was now Italy, while the high-quality breeding stallions had been kept at studs in North Tyrol and so were still in Austria. At that time there was hardly any cooperation between breeders in North and South Tyrol. But in the 1920s a new Horse Breeders' Commission was established in Bolzano in Italy, which was given governmental authority to inspect state-owned breeding stallions, register privately owned stallions belonging to Commission members. The Commission also gave prize money for horse show competition, and it governed the breeding of the Italian population of both the Haflinger and the Noriker horse. If not for the presence of Haflinger stallions at a stud farm in Stadl-Paura in Upper Austria after World War I, the Haflinger might well not exist in Austria today. Despite these stallions, the Haflinger breeding programs were not on solid footing in Austria, with governmental focus on other Austrian breeds and private breeding programs not large enough to influence national breeding practices. During this time, the breed was kept alive through crosses to the Hucul, Bosnian, Konik and Noriker breeds. In 1919 and 1920, the remaining stallions were assigned throughout Austria, many to areas that had hosted private breeding farms before the war. In 1921, the North Tyrolean Horse Breeders' Cooperative was formed in Zams, and in 1922, the first Haflinger Breeders' Show was held in the same location. Many extant Austrian Haflinger mares were considered to be of too low quality to be used as brood mares, and every effort was made to import higher-quality brood mares from the South Tyrol herds now in Italy. In 1926, the first studbook was established in North Tyrol. In the late 1920s, other cooperatives were established for Haflinger breeders in Weer and Wildschönau, and were able to gain government permission to purchase 100 Haflinger mares from South Tyrol and split them between North Tyrol, Upper Austria and Styria. In 1931, another breeders' cooperative was established in East Tyrol in Austria, and Haflinger breeding spread throughout the entire Tyrolean province. The Great Depression of the late 1920s and early 1930s dampened horse prices and had an unfavorable effect on Haflinger breeding. But from 1938 and after, markets improved as a result of the buildup for World War II. All crossbred horses and colts not of breeding quality could be sold to the army, and higher subsidies were given by the government to Haflinger breeders. However, the demands of the war also meant that many unregistered mares of Haflinger type were covered by registered stallions, and the resulting progeny were registered, resulting in a degradation of breeding stock. During World War II, Haflingers were bred to produce horses that were shorter and more draft-like for use as packhorses by the military. After World War II, breeding emphasis changed to promote refinement and height. Haflinger breeding programs almost collapsed as the military stopped buying horses and government-run breeding centers were closed. Breeders continued to emphasize those features necessary for pack horses, the largest use by the military, but neglected other key Haflinger characteristics. Haflinger breeding had to change to create a horse that better fit modern trends toward recreational use. Around this time, all small breed cooperatives were combined into the Haflinger Breeders' Association of Tyrol. In the years after World War II, some observers feared that the breed was dying out because of indiscriminate crossing with other breeds. At conferences in 1946 and 1947, the decision was made to breed Haflinger horses from pure bloodlines, creating a closed stud book with no new blood being introduced. The Tyrolean Haflinger Breeders' Association established its own stallion center and prohibited private breeders from keeping stallions, thus ensuring that the association maintained 100 percent control of breeding stallions. In Bavaria, several young stallions had been saved and breeders could privately own stallions. Bavarian and Tyrolean breeders maintained close ties and cooperated extensively. North Tyrolean breeders were also able to acquire several high-quality older stallions and lower-quality young stallions from South Tyrol. In 1947, the Federation of Austrian Haflinger Breeders was established as a governing organization for the provincial associations. At that time a large-scale breed show was held, attended by visitors from Switzerland. Soon after their return home sent a purchasing commission to Austria and were instrumental in founding the Haflinger population in Switzerland. Southern Tyrol had no difficulty in selling its horses, as all of Italy was in the market to purchase horses, and breeding populations spread as far south as Sicily. Between 1950 and 1974, even as the overall European equine population was dropping due to increased mechanization, the Haflinger population was increasing. In that time period, the population of registered Haflinger brood mares rose from 1,562 to 2,043. This was mainly a result of the increased marketing of the breed, and happened even as Norwegian Fjord horses were exported to Germany, reducing the resources available for Haflinger breeding programs. Through well-planned marketing campaigns, the Haflinger became the dominant small-horse breed in the region. In 1954, Yugoslavia and Italy purchased breeding stock from North Tyrol to establish their own Haflinger programs and in 1956 the German Democratic Republic followed suit. The first Haflingers were exported to the United States from Austria in 1958 by Tempel Smith of Tempel Farms in Illinois. Tempel Smith of Tempel Farms, Wadsworth, Illinois, imported them from Austria to begin a breeding program along with his imported Lippizzan horses. In 1961 they were introduced in Turkey, and crossed with the Karacabey breed. Others soon began importing Haflingers, and today there are a number of importers and breeders throughout the United States and Canada. While Haflingers are imported from Germany, Holland, England, and Italy, most continue to come from Austria. In 1963, the first Haflinger was exported to Great Britain. In 1969 two Haflinger mares were presented to Queen Elizabeth II upon her official visit to Austria, and in 1970, the Haflinger Society of Great Britain was established. The first Haflinger was exported to France in 1964, and they continued to be transferred to that country until 1975, when the breeding population became stable. Between 1980 and 2000, the population of Haflingers in France tripled. In 1965, the first international Haflinger show was held at Innsbruck, with horses from East and West Germany, the Netherlands, Italy, Switzerland and Austria participating. Haflingers were first exported to Belgium in 1966, to Bhutan in 1968, and to Poland, Hungary and Albania in subsequent years. The importations to Bhutan encouraged interest in the breed in other parts of Asia. In 1974, the first Haflinger was imported to Australia. 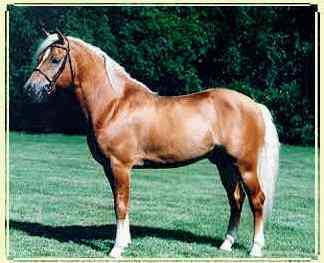 The first Canadian Haflinger was registered with the United States breed association in 1977, and a Canadian registry was formed in 1980. Between 1970 and 1975, Haflingers were also imported into Luxemburg, Denmark, Thailand, Columbia, Brazil, southwest Africa, Sweden and Ireland. They have also been imported into Japan. Haflingers maintained a population on every populated continent by the end of the 1970s. Worldwide breeding continued through the 1980s and 1990s, and population numbers increased steadily. Although the Haflinger is now found all over the world, the majority of breeding stock still comes from Austria, where state studs own the stallions and carefully maintain the quality of the breed. However, there are breeding farms located in the United States, Canada, Germany, the Netherlands, and England. As of 2007, Italian Haflingers had the largest population of any breed in that country. Due to selective breeding during the 1990s aiming to increase height, some breed lines became favored over others in Italy. A 2007 study found little inbreeding within the Italian Haflinger population as a whole, although certain less popular lines had a higher incidence due to the existence of fewer breeding stallions. Haflingers are bred throughout France, especially in the provinces of Brittany, Burgundy and Picardy, with between 350 and 400 foals born each year. Slovenia also has a small Haflinger population, with around 307 breeding mares and 30 breeding stallions as of 2008. A 2009 study found that although there was a very small amount of inbreeding in the population, it was increasing slightly over the years. As of 2005 there were almost 250,000 Haflingers in the world. On May 28, 2003, a Haflinger filly named Prometea became the first horse clone born. Bred by Italian scientists, she was cloned from a mare skin cell, and was a healthy foal. In 2008, Prometea herself gave birth to the first offspring of an equine clone, a colt named Pegaso sired by a Haflinger stallion through artificial insemination. The American Haflinger Registry does not allow horses born as a result of cloning to be registered, although as of 2010 other nations' registries have not yet entered a decision on the topic. In January 2012, Breyer Horses created a model horse of the Haflinger. The beginning of today's Haflinger can be traced to the year 1874 and the birth of the stallion, "249 Folie," out of a refined, native Tyrolean mare and sired by the half-Arab stallion, "133 El' Bedavi XXII." All purebred Haflingers trace their lineage to this stallion. Haflingers are always chestnut in color and come in shades ranging from a light gold to a rich golden chestnut or liver hue. The mane and tail are white or flaxen. The height of the breed has increased since the end of World War II, when it stood an average of 13.3 hands. The desired height today is between 13.2 and 15 hands. Breeders are discouraged from breeding horses under the minimum size, but taller individuals may pass inspection if they otherwise meet requirements of the breed registry. The breed has a refined head and light poll. The neck is of medium length, the withers are pronounced, the shoulders sloping and the chest deep. The back is medium-long and muscular, the croup is long, slightly sloping and well-muscled. The legs are clean, with broad, flat knees and powerful hocks showing clear definition of tendons and ligaments. 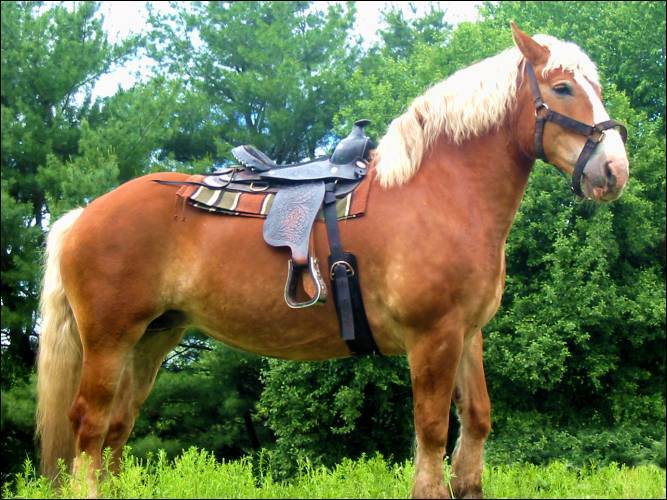 The Haflinger has rhythmic, ground-covering gaits. The walk is relaxed but energetic. The trot and canter are elastic, energetic, and athletic with a natural tendency to be light on the forehand and balanced. There is some knee action, and the canter has a very distinct motion forwards and upwards. One important consideration in breeding during the second half of the 20th century was temperament. A requirement for a quiet, kind nature has become part of official breed standards and is checked during official inspections. Today Haflingers have many uses including light draft, harness work and various under-saddle disciplines such as endurance riding, dressage, equestrian vaulting and therapeutic riding. Today the breed is used in many activities that include draft and pack work, light harness and combined driving, and many under-saddle events, including western-style horse-show classes, trail and endurance riding, dressage, show jumping, vaulting, and therapeutic riding programs. They are used extensively as dressage horses for children, but are tall and sturdy enough to be suitable riding horses for adults. Haflingers were bred to be versatile enough for many under-saddle disciplines, but still solid enough for draft and driving work. The Haflinger was originally developed to work in the mountainous regions of its native land, where it was used as a packhorse and for forestry and agricultural work. In the late 20th century Haflingers were used by the Indian Army in an attempt to breed pack animals for mountainous terrain, but the program was unsuccessful because of the Haflinger's inability to withstand the desert heat. The Austrian Army still uses Haflingers as packhorses in rough terrain. They are used most often in high Alpine terrain, with slopes up to 40 percent and steps of up to 16 inches. There are around 70 horses in use by the US 6th Infantry Brigade and based in Hochfilzen. The Haflinger is also used by the German army for rough terrain work and demonstration purposes. The World Haflinger Federation (WHF), the international governing body that controls breed standards for the Haflinger, is made up of a confederation of 22 national registries, and helps set breeding objectives, guidelines and rules for its member organizations. There are currently over 20,000 Haflingers registered in the U.S.
As stated previously, Haflingers are always chestnut in color and come in shades ranging from a light gold to a rich golden chestnut or liver hue. The mane and tail are white or flaxen. So yes, besides having great dispositions, Haflingers are beautiful.